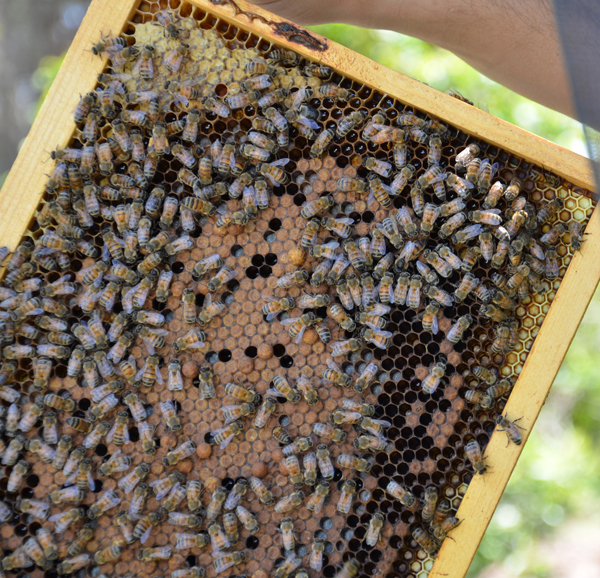 To bee or not to bee – the trials and tribulations of being a beekeeper. Sometimes when you install a new queen in a nuc they don’t always release the queen on their own. There is a layer of candy (similar to fondant) that keeps the queen trapped in her cage and the bees eat through that to release her. Strong hives can accomplish this in a day or less. For young, small nucs this can take more time and sometimes we step in to help them out. 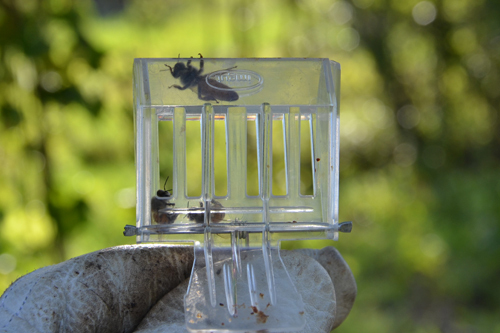 Here is how we released a queen from her cage into the hive. You can see her come out of the cage at 0:49. Supersedure cells will often be in the middle of a frame, not at the bottom of a frame like you would see with swarming. In our case we believe the bees sensed the queen was getting old (she is over a year old now) and decided they needed to replace her with a younger queen. It was truly a sad sight to see our good old queen right next to the cells of the queens that would eventually take her place. 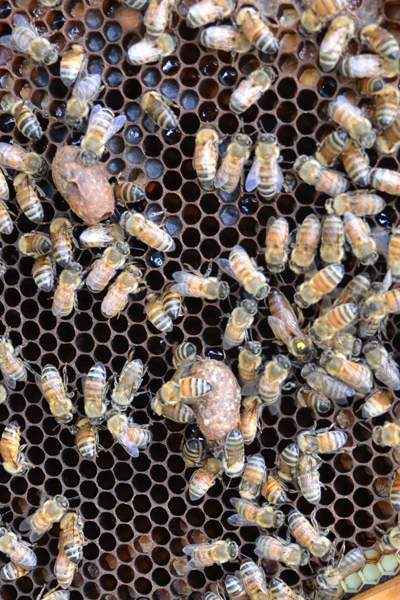 You can see 2 large queen cells on the left and our old queen with a yellow dot towards the middle on the right side. 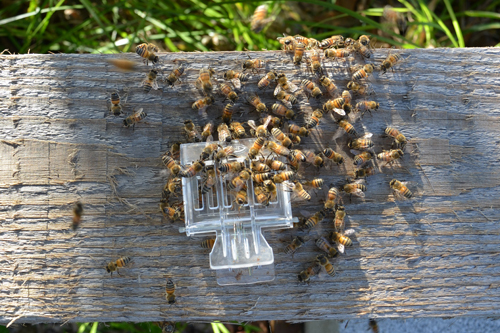 Allowing the bees to produce their own queen is usually not successful in our experience. This is due to the fact that we don’t have enough hives to produce a really good drone pool and the chances of the queen mating with an Africanized drone are possible too. So this hive will either be re-queened with a hygienic queen that we will buy from a local supplier or we will combine it with another hive. I thought it would be helpful for some of the beginners out there to see a frame with some important elements pointed out. I’m also providing a link to the full resolution versions so that you can zoom in. Frame with important elements marked. Click here for full resolution file of marked up frame. Click here for full resolution file of unmarked frame. 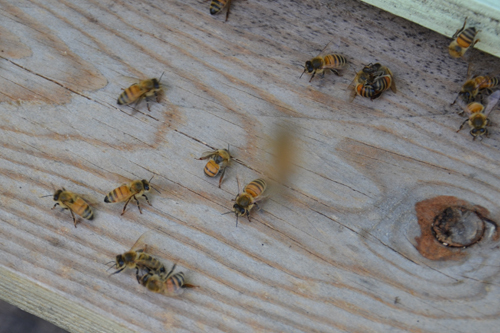 A small swarm of Africanized bees tried to enter and invade one of our European honey bee hives. This is the second time we have been able to witness this interesting and natural phenomenon. The first time we witnessed a swarm trying to enter a hive was a year ago. When we arrived at our bee yard and got out of our truck, we were met by a few aggressive bees. We thought this seemed odd since our gentle honey bees usually don’t chase us unless something is wrong, so we continued as usual to inspect our hives. We opened up the first 2 hives and everything looked normal – the bees were calm and we saw eggs, a sign that the hives had a queen. We closed up the hives and moved along to our next set of hives about 25 feet away from the first set. Within about 10 mins I saw bees swarming – a cloud of bees flying around. 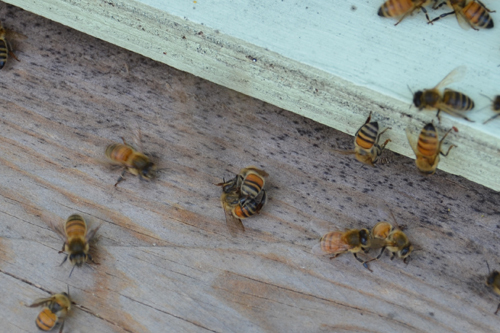 We rushed back over to see what was going on, and found that one hive was being attacked. There was a gathering of bees on the back of the hive and bees in the front of the hive were fighting. Swarm gathered on back of the hive. 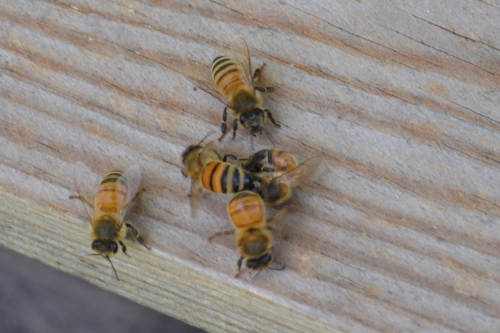 As my husband took a closer look at the bees gathered on the back of the hive, he saw a queen! This was the queen from the small swarm. What are the chances we would see that! I caught the queen to make sure she would not enter our hive and try to kill our good queen. In the meantime, the worker bees continued to fight. I put the queen to the side and after about 15 minutes the swarm gathered around the trapped queen and things started to calm down at our hive. Queen from the swarm caught! I put the queen aside and the swarm gathered around her. As I walked around I found where the swarm originated from in a small tree close to our hives. 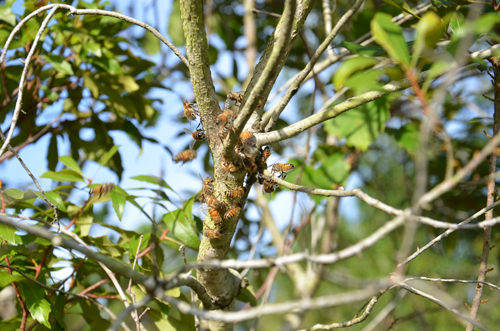 Africanized bees usually have small swarm clusters that are capable of invading established hives and taking over. This is part of their natural behavior. Tree where the small swarm was hanging out. Since the swarm was close by they probably smelled our hives when we opened them up for inspection and were attracted to them. Before we left, we had to take care of the swarm queen. In order to make sure she would not invade our hive we had to kill her. Sad, but necessary to protect our hive. We requeened a few of our hives this weekend. We buy our queens from a local supplier. I took a short video showing how we install the queen cage. You can see the bees immediately smell the queen and come towards the cage to release her. The tip of the cage is full of fondant. The worker bees will eat through this and release the queen into the hive. We usually go back in 24 hours to check and see if the queen has been released. If not, we open up the cage and set her free into the hive. The next week will be crucial to make sure that she is fully accepted and will begin laying eggs. It is best to leave the hive alone for the next 7-10 days. 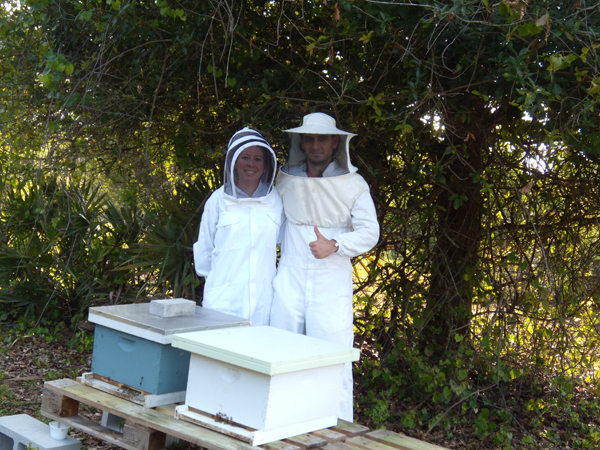 This weekend we split two of our strongest hives and created two new hives. We did this to increase the number of hives we have, but to also prevent swarming. Spring is prime swarming season, so we do what we can to reduce the chances of that happening. There are several ways to make a split, and every beekeeper will have different methods and advice. 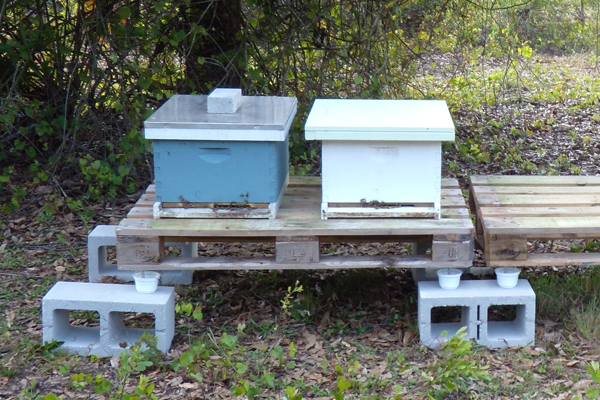 I will explain the method we used, but before making a split of your own always make sure the hive is strong enough to split, that you have the necessary equipment (including ordering queens ahead of time if you go that route), and that the weather is warm enough. Make sure the strong hive has at least 8 frames of brood. Move 4 frames of brood and 1 frame of honey into a new hive. Locate the queen and move her to the new hive. 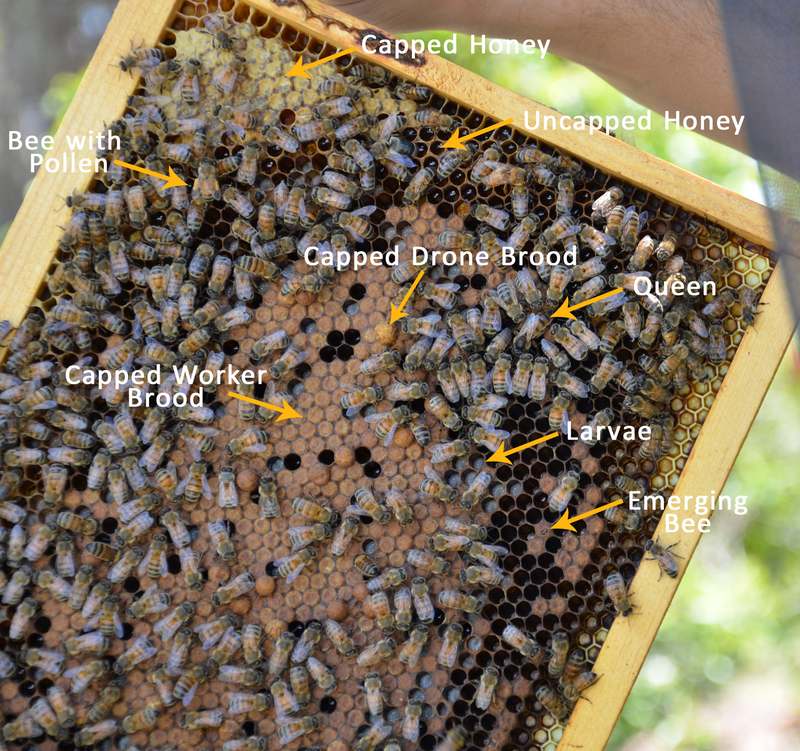 Make sure the old hive has at least 4 frames of brood, including a frame with eggs/uncapped brood, and 1 frame of honey. 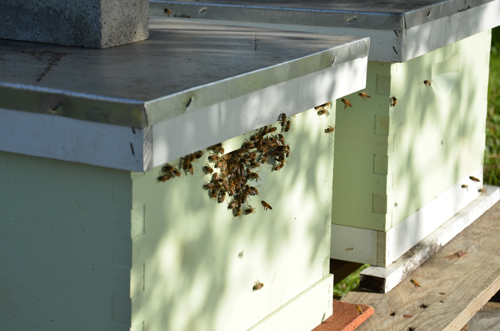 Fill in the rest of the old and new hives with empty built or new unbuilt frames. Put entrance reducers on the hives. The eggs/uncapped brood in the old hive will give the worker bees what they need to produce a new queen. We’ll give them 2-3 weeks to produce a queen. If they are unsuccessful, then we will introduce a mated queen from a local queen supplier. Alternative method: After the split you can wait 24 hours and then introduce a new mated queen instead of waiting for the hive to produce their own queen. If you are using new unbuilt frames, then you should also feed. Feeding stimulates wax production so the worker bees will build out those new frames faster. Entrance reducers help the smaller population guard the entrance of the hive from pest and other intruders. I’ve put together a Q&A list of some common questions. Why to split a hive? There are a few reasons to split a hive. How does splitting discourage swarming? When a hive becomes strong, it is a natural behavior for part of a bee colony along with the queen to leave the hive and create a new hive. This is the way bees reproduce in nature. When you split a hive you are removing half of the bee colony. This makes the bees “think” they have swarmed. How does splitting control mites? When you leave a hive without a queen for 2-3 weeks that breaks the brood cycle. Mites reproduce by laying eggs on bee brood, so if the bees are not producing brood, mite populations decrease. Do I need to feed? If you have introduced new unbuilt frames into the hive then, yes, you should feed. This will help the bees draw out comb faster. Just use a 1:1 ratio of sugar and water. If you are using empty built frames and have enough honey in the hive, then you should be okay not feeding. Bees consume about six pounds of honey to produce one pound of wax. Here we are with our 2 new hives. Just wanted to give a quick update of our weekend inspection. A few weeks ago I posted about a queenless hive and a round queen cell. Well, we have a new queen! We didn’t see her, but we did find new eggs and very young brood, positive signs that there is a queen. 🙂 We’ll try to find her and mark her during our next inspection. Then we had a hive that was not doing so great these past weeks. It happens. The population was dwindling and the queen was not laying, so we had to make a decision. We killed the old queen and combined the weak hive with one of our strong hives. We decided not to requeen because the population was small and could not support a new queen at this time. Soon we’ll split the strong hive, thus creating a new hive and give the bees a chance to produce a new queen. Receive an email notification after our next bee adventure. Enter your email address below and click sign me up!